Memento Vivere! 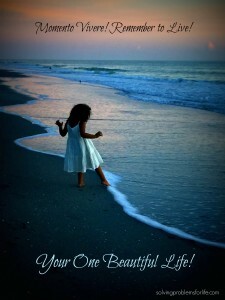 Your One Beautiful Life! The phrase YOLO is popular in youth culture right now. It is the acronym for “you only live once”. It is similar to the Latin phrase carpe diem (seize the day) and implies that one should enjoy life, but also includes taking risks and almost a “whatever” attitude. There is another Latin phrase that might influence the “reckless” air to YOLO and that is memento mori, which advises to “remember that you have to die”. Seriously, have you forgotten to live? Have you forgotten how to live? We get One Beautiful Life…only one! How are you living it? Life’s “stuff” just keeps coming at us. It is the day in, the day out…the grind…the need to’s and the should haves…one obligation after another and more often than not everyone else’s needs are presented as a crisis. Then the real crises come and there is no emotional energy to navigate them. Most of the time we are reacting to our lives and trying to survive, right? and you can handle whatever your work, home and the people in your sphere request of you. If you are anything like me sometimes you even pride yourself on that “can do” attitude and how much you can handle. But the truth is we are both exhausted. We scrape energy from the bottom of a nearly dry well. If we admit it, we are also hiding from our relationships because we are simply too tired to invest in them anymore. This life doesn’t feel very beautiful. You know there is beauty in the midst of struggle, but it is so hard to see and most of the time you’re tired, sad, and even a little angry that you give so much and know one seems to notice. You are so unappreciated. You are finding it hard to even appreciate yourself when you look in the mirror and are reminded that you haven’t taken very good care of that person looking back at you. Does this describe you? It certainly described me! Memento vivere!!!! Remember to live!!! You were created for a Beautiful Life. There are dreams inside you that inspire you to live…to breathe in big gulps of reviving oxygen. You have gifts and ideas that make you want to get up in the morning with a wonderful, exciting plan for the day and the days ahead. Do you want to discover beauty again? Do you want to live with joy and expectation? The clock is ticking. Remember to live, Your One Beautiful Life!